Wireless iPad integration with "page turner" for iPad digital gradebook and audio recorder via "page turner"
100 Styles including 8 and 16 Beat as well as Country, Latin, Disco and Dance. There are others of course, and this is quite an extensive variety of ?backing bands? especially for a beginner. 100 Songs ? excellent practicing tool One can enjoy some of the most famous music pieces , jam along, and practice with them. Songs include various traditional songs, like ?We wish you a Merry Christmas?, ?My Bonnie? and some classical pieces like ?Spring? from Vivaldi. 392 tones out of which 14 are drum kits. Okay the sound can?t be compared to the high end keyboards, but pianos, organ, and some brass are actually pretty good. For a beginner excellent. Lighting keyboard is a good option for the beginners. USB connectivity is excellent option for more advanced players. It even makes EZ 220 midi controller. It can be used with applications like Garage band. I Pad connectivity is awesome. EZ 220 page turner, makes playing much more fun. This keyboard is great for a learner/beginner - I bought this as a present for my girlfriend and while I was at first doubtful about the light-up keys, she loves it and finds the light up keys really useful and helpful. It's a nice piece of engineering that plays to you and visibly shows you which notes to play - really strengthening sight and listening skills simultaneously. 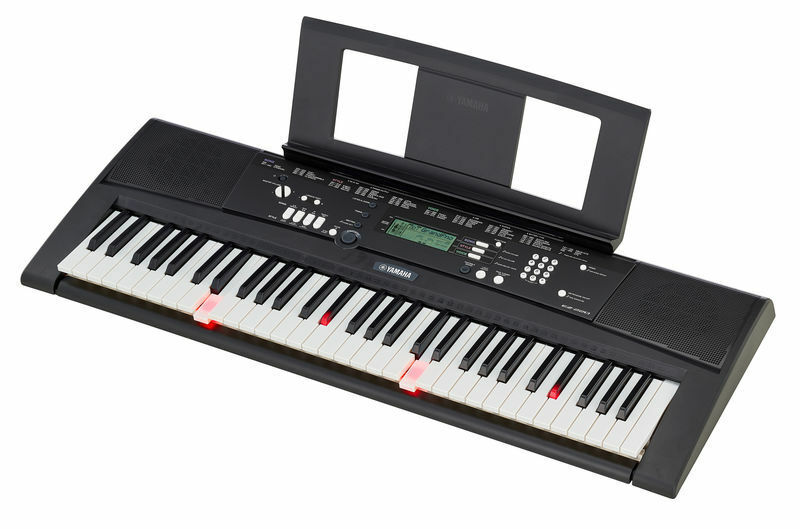 While the keyboard only has one jack output, making it generally unsuitable for gigs or stage play, this keyboard is perfect for home practice. It's not too big so it sits nicely in the room, but it's also got a good number of keys on it, giving it that piano feel. The tones and songs on the keyboard are great and sound good through the built in speakers. This is a sturdy, durable and well made product, and all in all, well worth the money.